Architect Andrew McAvoy created an earth-sheltered house in Scotland for Gavin and Angelique Robb and children Scarlett and Gus. Cor-Ten steel from a ship building yard clads the new structure, which connects via a glass “bridge” to a rebuilt stone farmhouse containing the bedrooms. McAvoy worked with builder Stephen Campbell on structural elements such as the glass floor and walls. The bottom floor contains the kitchen and the dining area; the lounge is upstairs. The cabinets are from Ikea, as are the table and chairs, and the child’s Tripp Trapp chair is from Stokke. The lounge, with maple flooring from an old school in nearby Aberdeen, has a Togo sofa by Michel Ducaroy for Ligne Roset. Designer Sue Macintosh chose the Farrow & Ball Off-Black paint for the master bedroom. A Woolly Pocket planter hangs on the steel beam above a polished-concrete floor warmed by radiant heat. McAvoy rebuilt the farmhouse’s original stone walls piece by piece. The couple found the sofa and ottoman at a local shop, Annie Mo’s. For the new structure, Grace & Webb fabricated a laser-cut steel balcony. Reclaimed oak beams dominate the upstairs lounge, which leads to the guest bedroom. The glass balustrade and floor were sourced in Germany and installed by James Aiken. Angelique, the founder of Papillon Designs and Landscaping, clustered plantings around the exterior glass addition. “The house is always the perfect temperature. The only way you get cold in this house is if you’re coming down with a cold—it’ll be your own internal thermostat,” Angelique Robb says with a laugh, as she surveys the light-filled and beautifully temperate open-plan living area of the new home that she shares with her husband, Gavin, and their children, Scarlett, five, and Gus, two. Surprisingly, this cozy and partially earth-sheltered family home—which is, according to Gavin, “one step away from Passive House standards”—started life as a series of derelict and semi- derelict farmstead buildings in raw and rural Aberdeenshire, in the hinterland of Scotland’s northeast coast. Perhaps also surprising is the fact that, in 2005, when Angelique and Gavin bought the run-down buildings, complete with asbestos roofs and an old milking facility, a full-on home-building challenge was the last thing on their minds. Angelique and Gavin, a construction consultant in the oil industry, eventually enlisted the expertise of Glasgow-based architect Andrew McAvoy of Assembly Architecture, and “fell in love with his ideas,” says Angelique. After studying mid-19th-century maps of the old steading buildings, McAvoy convinced the couple to follow the original U-shaped arrangement around an entrance courtyard by creating two new energy-efficient houses that would share the courtyard but have private aspects and gardens. First to be completed was Gavin and Angelique’s current home, Skye Steading, which they project managed from an onsite trailer over nearly three years of construction. The second house, basically a mirror image of, and connected to, the first, is under construction and due to be completed in the fall. Essentially, Skye Steading is a granite farm building that was rebuilt into a contemporary dwelling comprising three bedrooms (including the master), a bathroom, an office (which can become an additional bedroom, if needed), and a one-and-a-half-story, open-plan, newly built kitchen and living-dining area, with a large lounge space above. “The intention was to locate the bedrooms in the stone steading, which has small window openings, so the rooms are more secluded,” says Angelique. “In contrast, we wanted a lot of glazing and large open spaces in the new build.” Spectacularly, the new wedge-shaped building, which is partially sheltered in order to duck the harsh northeasterly winds, features Cor-Ten steel cladding—one of only a few residential buildings in the UK to employ the material in this fashion. “Honest, good-quality materials,” locally sourced whenever possible, and the use of trade specialists were intrinsic to the overall success of this old-meets-new building. Traditional green oak purlins, rafters, and floor joists combine with contemporary steel to form the internal framework of the new building, with thick, polished concrete floors storing warmth from the radiant-heat flooring. In much the same heat-retaining way, the Trombe walls store sunlight filtered through the glazed “walls.” The illusion of more light is achieved via a glass walkway between the lounge and the guest bedroom in the space connecting the two buildings. 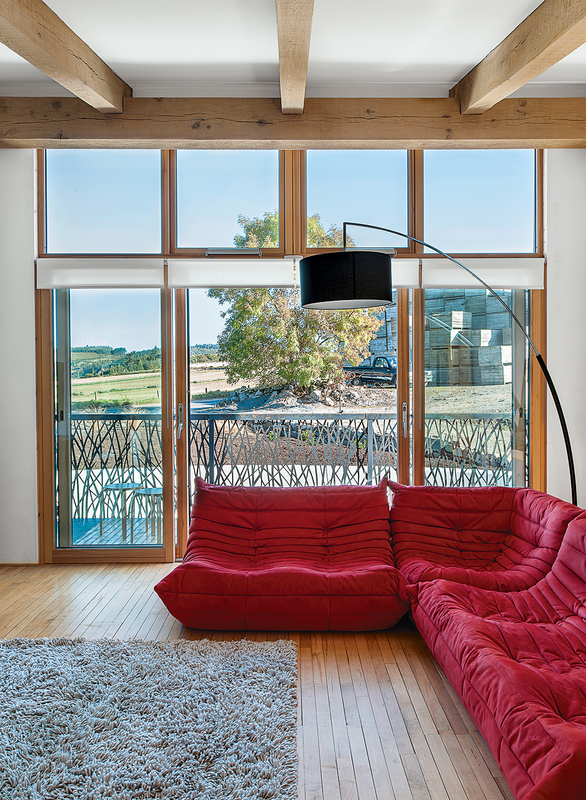 Sheep’s wool insulation and a sedum roof allow the house to breathe and maintain a cozy indoor climate. Consequently, the couple’s energy bills are considerably less than they were in their previous flat, which was half the size of their current home. 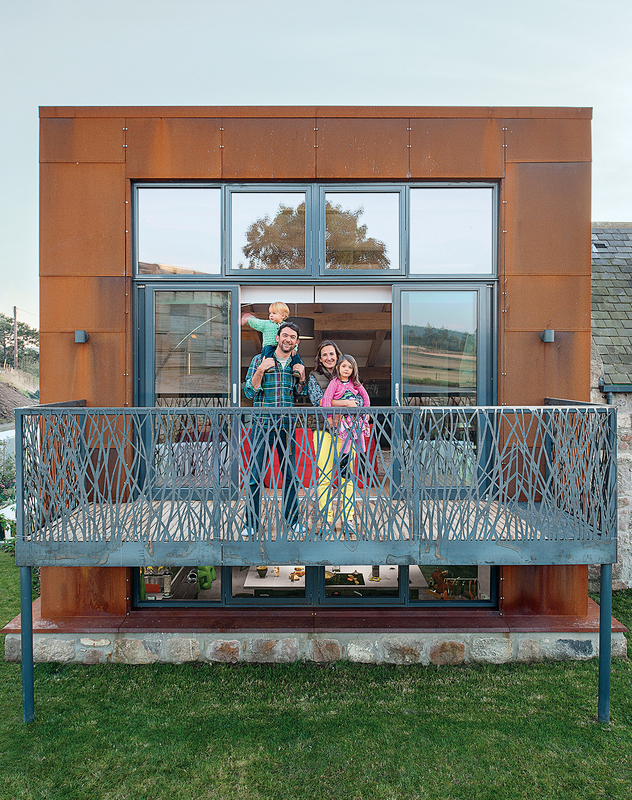 “We love the look,” says Gavin of the Cor-Ten steel cladding. “It enhances how solid the build is. It sounds really radical but actually has a very muted look that some people still mistake for a timber finish when seen at a distance. The material will last for hundreds of years with zero maintenance, and any aging actually improves its appearance.” As far as Gavin and Angelique know, there are only a few other buildings in the UK that use Cor-Ten cladding, including Cremorne Riverside Centre, in London, by Sarah Wigglesworth. The couple flew down to London especially to see how it was constructed and examine the detailing. In creating the skeleton for the new parts of the steading, portal frames were created from a combination of steel and wood. The wood, a European green oak, was married to stainless steel via slip connections that allow for shrinkage. The oak provides strength and durability, while the steel staves off any tannin corrosion and staining problems. Armour-Chem’s Polyurea Elastomer from Site Sealants is an alternative to the usual welded membrane for green roofs. When sprayed on, the material provides a strong, impact-proof, waterproof covering that should not deteriorate or require any maintenance. And there are no welded seams—always a weak point—to fail.